One of the meanings of vinyasa is to link movement with breath, and all classes focus on this aspect. The pace of vinyasa can vary with the teacher, but all classes build well-rounded fitness, including wrist strength, shoulder strength and core strength. Classes start with breathing exercises and warm-up movements, progressing to sun salutations that continuously link both standing and seated postures. In vinyasa there is less emphasis on workshopping poses and more emphasis on getting into a flow for the session. Assumes knowledge of the fundamentals of yoga. Postures are more flowing. Requires a higher level of fitness and experience. Focus is on the full complement of a complete yoga class: asana, pranayama and meditation. Of 2 hours duration, advanced practice requires a mature level of commitment with the assumption of prior vinyasa experience. 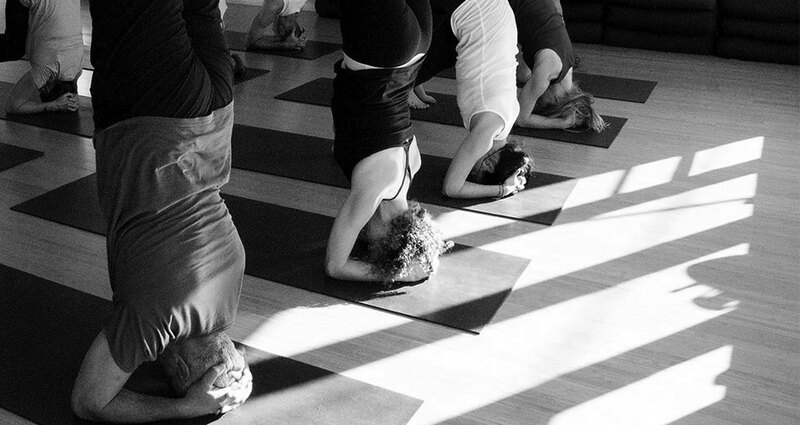 Unlike all other classes at the Livingroom, there is an emphasis on inversions such as urdva mukha vrksasana (handstand), pincha mayurasana (feathered peacock), and sirsasana (headstand).